Recording images of living organisms at high frame rates with a fluorescence microscope is challenging. High-speed imaging requires a considerable light intensity, because at high frame rates the image sensor is exposed to light very briefly. During that short period of time, enough light needs to be captured to obtain a clear image. Normally, this is achieved by increasing the intensity of the illumination. Because the more light bounces off the object, the more light reaches the camera. But when studying fluorescence or chemiluminescence, the object itself emits light and increasing the intensity of the emitted light is often not possible. In such a situation, the solution is to increase the intensity of the light that is detected by the camera. At the Max Planck Institute for Heart and Lung Research in Bad Nauheim (Germany), the cardiovascular system of the zebrafish is studied. The transparency of the zebrafish (figure 1) and its experimental advantages make it an ideal scale model of the human cardiovascular system. Figure 1. Photo of a zebrafish. The heart is located inside the red square. 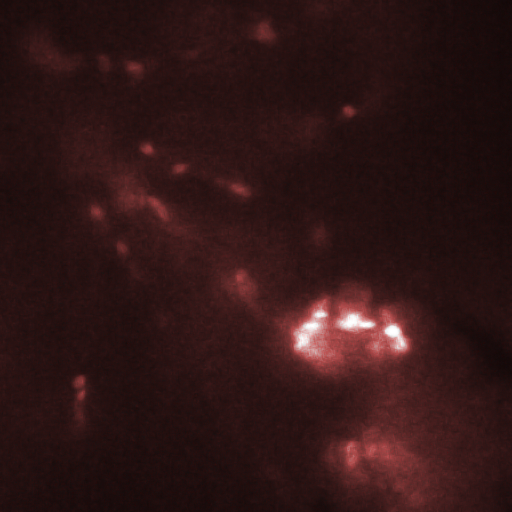 To study the blood flow in a zebrafish, the red blood cells are labeled with the fluorescent protein DsRed. The intensity of the fluorescent light is limited by the finite number of fluorescent proteins attached to the red blood cells. Also, the direction in which the light is emitted is random, which further decreases the amount of light reaching the camera. A low light intensity is not necessarily problematic. Increasing the exposure time to capture sufficient light is a well known method for imaging dim objects that are stationary. However, using the same method on a moving object results in blurred images. 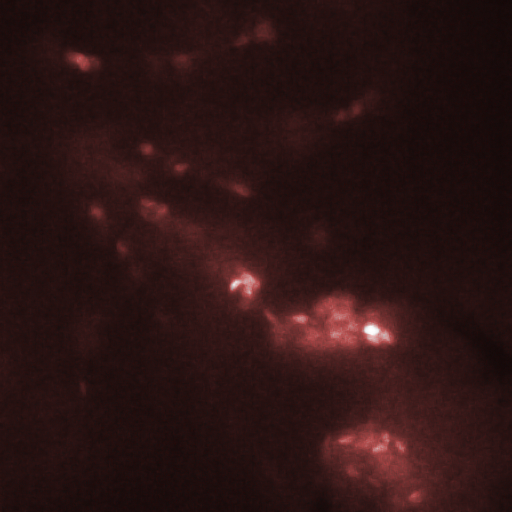 When imaging a living zebrafish, its internals are moving. The heart rate of a zebrafish is approximately 175 bpm, or nearly 3 beats per second. To capture each phase of the heart beat requires a high frame rate, because otherwise the images will be distorted by motion blur. This means the image sensor is being exposed to the dim fluorescent light very briefly. Increasing the amount of fluorescent light by increasing the intensity of the excitation light is not an option, as this would harm the fish. Figure 2. HiCAM attached to fluorescence microscope. The zebrafish is studied with a fluorescence microscope with high-speed camera system mounted to it (figure 2). The fish is fixated in a gel and illuminated from below. 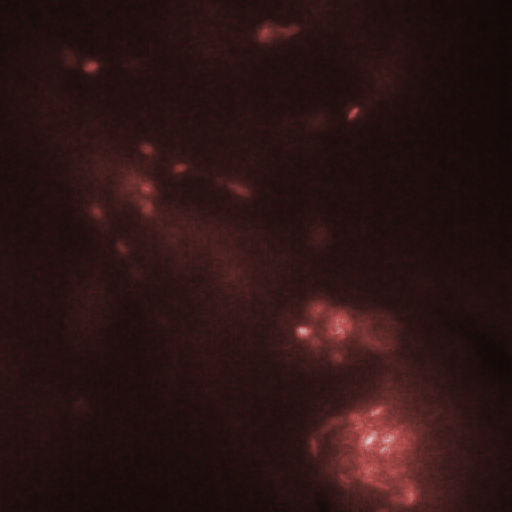 Fluorescent light from the DsRed protein is emitted from the red blood cells. This light is emitted in every direction, some of it traversing the optical path of the laser in the opposite direction. But instead of being reflected back towards the light source, the fluorescent light is directed towards a camera through a dichroic mirror. Any scattered excitation light is reflected by the dichroic mirror. An optical filter removes any background light and only transmits light at the wavelength emitted by fluorescence of the red blood cells. An image sensor will capture the incoming fluorescent light. At frame rates of hundreds or thousands of frames per second, the exposure time for each frame is in the order of several milliseconds to fractions of milliseconds. Electron-Multiplied CCD (EMCCD) sensors have a light sensitivity that is good enough to capture the dim fluorescent light. But they can only achieve frame rates up to approximately 100 fps at full resolution, which is not enough for the application at hand. CMOS sensors can operate at higher frame rates, up to thousands of frames per second at full resolution. However, during the short exposure time of each frame, a regular high-speed CMOS sensor is not able to record a sufficient amount of light to achieve a reasonable signal-to-noise ratio. Figure 3. Red blood cells in the heart of a zebrafish (bottom right corner of images) are transported from one chamber to the next chamber (a-c) and into the aorta (e). Images shown here were recorded with an interval of 25 ms between them. Recording was done at 2000 fps with an exposure time of 500 us. The HiCAM achieves both the required light sensitivity and the high frame rates by combining a high-speed CMOS sensor with an image intensifier. The image intensifier increases the number of detected photons by several orders of magnitude. This way, it is possible to record the blood flow in a zebrafish at 2000 frames per second. Figure 3 shows the flow of red blood cells through the cardiovascular system of the zebrafish.